Here is important news for candidates that Staff Selection Commission is going to conduct Combined Higher Secondary Level Exam. Those, who wish to appear in the exams, may start filling SSC CHSL Application Form 2019. As per the SSC 10+2 Registration Notification, the written exams will be held shortly. Get more related information below. So this is the thing that everyone should know that SSC CHSL exam is the top grade exams for 10+2 aspirants. Candidates, after selection, get posted on the posts of Postal Assistant and Sorting Assistant DEO (Data Entry Operator) and LDC (Lower Division Clerk). Lots of aspirants appear in the exams to secure them a fruitful career in government sector. Keeping this in mind, our team has gathered this piece of information. Let’s have a look at the latest updates here. From the sources, The totaljobshub team has collectively arranged the data for our job seekers. According to the updates, the SSC CHSL Notification 2019 now available the Last Date for Filling the Form is 18th February 2019. The written examination Part-I will be held from soon whereas TIER II held in upcoming days. Find more info in the given sections. Applicants must have successfully completed Higher Secondary Exams from a state or central Education Board. S/he should be at least 18 years of age & maximum 27 years. Relaxation to the suitable ones is given here. SC/ST- 5 years, OBC-3 years, PH-10 years, PH with OBC-13 years, PH with SC/ST -15 years. Fee applicable is Rs.100 which can be either paid via online/offline mode through SBI Net banking/Debit/Credit Card. Transaction charges may apply. For offline application method, Rs. 100 is to be paid through CRF Stamp. Applicants need to get the CRF Stamp canceled before finally sending the applications. The SSC CHSL examination is Computer-based Examination named as Tier-I, Descriptive Paper known as Tier-II and Typing Test/Skill Test which is also called as Tier-III Examination for the same positions of Data Entry Operator, Postal Assistant & Sorting Assistant (PA/SA), Lower Division Clerk and Court Clerk. Tier I exam is computer based or objective type. This paper will carry total 100 objective type questions. Negative marking is applicable, 0.50 marks for each wrong answer. 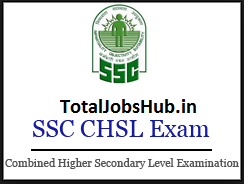 SSC 10+2 Tier-II paper of CHSL 2019 is a descriptive paper which comprises of 100 marks. This test is given as a Pen and paper mode test. The time duration of this Pen Paper Test would be for 1 hour. The Paper contains the Essay writing of 200-250 words and Letter / Application writing of approximately 150-200 words. The last stage of this examination is popularly known as Tier-III which contain the Skill Test/Typing test, we can say qualifying nature test. The final merit of the qualified aspirants would be determined totally on the basis of the total score obtained by all of them in Tier-I and Tier-II. This test will be conducted in Hindi and English both for the qualified applicants of written examination. The applicants need to mention the language of writing amid filling online form. This examination is likewise qualifying in nature. The writing speed for the English language ought to be 35 words/minute and for the Hindi language should be 30 words/minute. This test will be led for qualified applicants of written examination. The applicants must keep up information data entry of 8,000 key depression/hour on the computer. These entries will be judged on the premise of right sections. The time duration of this expertise test will be 15 minutes. A printed matter of 2000-2200 strokes/key-discouragements in the English language will be given to every hopeful. Two-staged written exam and Skill Test/Typing Test for both the posts will be conducted. The written exam will be taken in two parts, Part-I and Part-II. The final stage to clear will be the face-to-face Interview. Look for SSC CHSL Application form 2019 and download it. Read through the data via this Notice very carefully. Start applying online and fill the form with the details that are required. Save the form data and get it printed. Keep a copy safe for future reference. For offline SSC CHSL Application Form, candidates can purchase the application form from any authorized sale office or a nearest Post Office. After fulfilling all the formalities, the duly filled Application form then, to be sent to the SSC Office.